About 168,000 South Australian households will save up to $531 off their annual electricity bills after Origin Energy was selected to provide the SA Concessions Energy Discount Offer. The offer is available to South Australians eligible for the existing State Government energy concession. A significant number of the 168,000 eligible households are currently on a standing energy contract and will soon receive a letter explaining the offer and how to sign up. Customers will need to sign a simple form and return it, to take up the Origin Energy special offer. 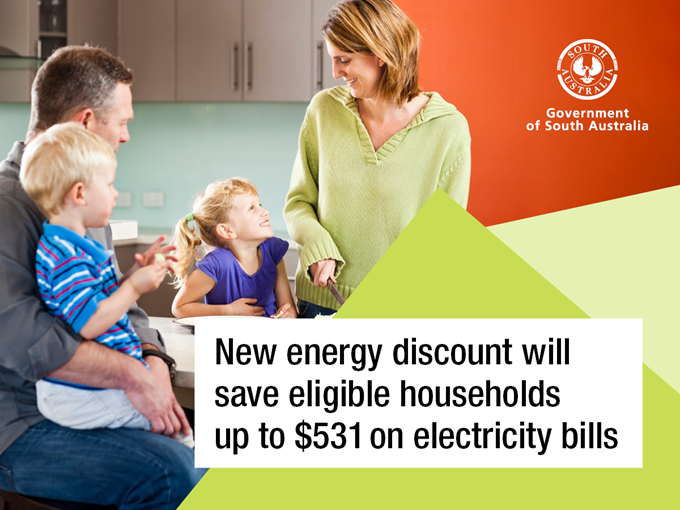 The offer adds up to a saving of between $253 and $531 per annum for households on a standing energy contract. The existing energy concession is worth up to $217 a year and is not affected by this new offer. The State Government provides $170 million worth of concessions to more than 180,000 households for expenses including energy, water, sewerage, the Emergency Services Levy and the Cost of Living Concession. All households should visit the energy made easy website to find the best energy deal for their household. The site provides comparison information, including standard and market offers for energy retailers. For the 168,000 South Australian households on lower incomes, a saving of up to $531 is a significant boost to their budget. The State Government is committed to reducing the cost of living for South Australia’s most vulnerable households. The majority of people receiving energy concessions are on standing contracts and the Origin Energy offer provides a much better deal for them. If you don’t currently receive an energy concession, but are on a low or fixed income, you may be eligible for State Government concessions. Find out more about available concessions.